OMG! Come and see wonders today at CES (The largest tech show on earth 2017) when Asus announced two new smartphones, both of which have been in the rumors quite a lot lately. We're talking about theZenfone AR andZenfone 3 Zoom. And then, Asus Zenfone AR is a phone that is trying to drag us into the future, it is the first smartphone capable of both VR and AR, it's also only the second-ever Tango-compatible Android handset. It has a large camera module that looks like something from Nokia's now-gone Lumia smartphone series. 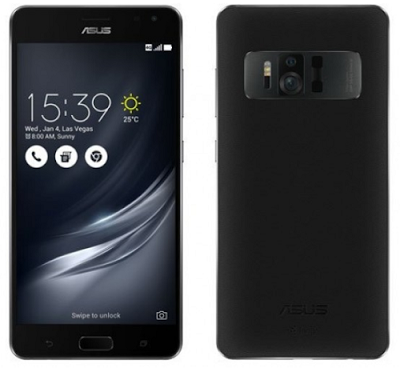 The Asus Zenfone AR is a sleek, 5.7" device with all the regular features of your modern-day smartphone: a high-res Quad HD display, a fingerprint scanner, and it's powered by Qualcomm's Snapdragon 821 chipset aided by a whopping 8GB of RAM - This makes the Zenfone AR one of the first phones with 8 gigs of RAM on board, but it is really the augmented reality that is the king here. See Also: Corning Gorilla Glass 5 With Boost In Shatter Resistance. Like seriously, The main snapper is a 23 MP unit using Sony's IMX318 sensor, with OIS, EIS, and 4K video recording. Thanks to Google's Tango requirements, on the back there's also a motion tracking camera and a fisheye depth-sensing camera. Well, Asus Zenfone AR release date is set for the second quarter of 2017…Though there is no fix date for it but very soon, it will be available.